Three Days Down, Three to Go at Vans Pro ECSC in Virginia Beach | EasternSurf.com | All East Coast. All The Time. VIRGINIA BEACH, Virginia/ USA (Thursday, August 24, 2017) – A rising nor’easter delivered fun, one-to-three-foot conditions to start Thursday’s action at the World Surf League (WSL) Vans Pro Men’s Qualifying Series (QS) 3,000. The remaining six heats of Round 3 were contested before diving straight into Round 4 battles where top seeds made their big debuts. Sparks ignited with powerful, high-performance surfing from some of the QS elite and Championship Tour (CT) caliber competitors in attendance to determine crucial Round 5 match-ups. 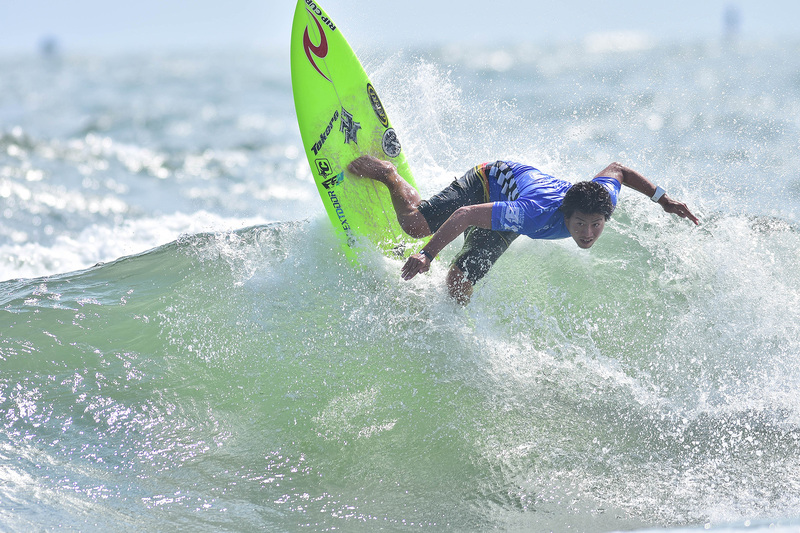 Chiba, Japan native Reo Inaba (JPN) unleashed two critical turns on a 1st Street Jetty gem for a near-perfect 9.77 (out of a possible 10), the event’s highest single-scoring wave so far, and garnered a massive 16.60 (out of a possible 20) heat total. 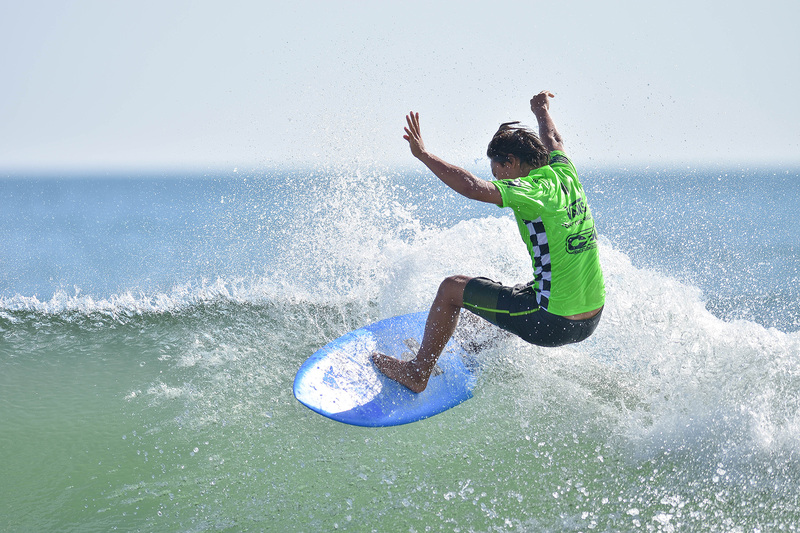 Inaba’s prowess in small waves gave him a big edge as he had the field in a combination situation, meaning the competitors needed two new scores to match Inaba’s heat total, when the final horn sounded. The Japanese contender currently sits at No. 124 on the QS and looks to hit his stride heading into the back half of 2017. Former CT competitor Keanu Asing (HAW) found near-perfection of his own with a 9.23 and highest heat total of the event so far — a 16.90. The South Shore, Oahu native is on track to making his way back to the Dream Tour after winning the Barbados Surf Pro QS3,000 earlier this year and an equal 9th at the Ballito Pro QS10,000. But, he’s looking to shake off an early upset at the Vans US Open of Surfing. Asing’s competitive surfing year isn’t the only thing looking bright after recently marrying long-time girlfriend Kailin Curran to add more positives toward his year. After Kanoa Igarashi’s (USA) first-ever Vans US Open of Surfing win, he finds himself at No. 3 on the QS to back up his Sophomore slump on the CT. The Huntington Beach, California native made it his goal to stay in a jersey this year and has done just that — already taking part in six QS events in addition to his Dream Tour schedule. Igarashi began his momentum in Europe last year to re-qualify, in addition to making it in the Top 22 of the CT for double re-qualification, but is already on the right path to find his winning form earlier in the year. Current QS No. 5 Griffin Colapinto’s (USA) returns to Virginia Beach a full-time QS surfer, after earning a spot in the Vans Pro Junior last year, and did so with an unrivaled forehand in Round 4’s opening heat. The 19-year-old showed his growing maturity in competitive surfing with patience and attacking the opportunities that came to him — earning an 8.17 and 15.07 heat total out of his three waves ridden. Colapinto is taking advantage of the Virginia Beach atmosphere before preparing for an important European leg ahead of him. Miguel Pupo (BRA) continues to impress at the Vans Pro with his fourth-straight heat win to earn a spot into Round 5. The Brazilian CT competitor found his rhythm late in the heat after a slow start and made a big comeback to overcome Australian contender Wade Carmichael (AUS), 2016 North America QS Regional Champion Kilian Garland (USA), and an in-form Facundo Arreyes (BRA). Pupo’s mindset to stay busy paid off, but still feels there’s more to improve on after a blistering Round 1 performance earlier this week. On Wednesday, Stevie Pittman (USA) blasted his way through both Rounds 2 and 3 with powerful surfing in the deteriorating afternoon conditions. His efforts earned him an excellent 8.17 (out of a possible 10) and the day’s highest heat total of 14.34 (out of a possible 20) in Round 3. The North Carolina native finds himself back in the competitive groove after undergoing knee surgery last fall. Pittman is also into the Vans Pro Junior Quarterfinals and did battle with former Pro Junior competitor Kei Kobayashi (USA) in a tight Round 3 bout where Kobayashi earned his own excellent 8.10. But, in the end it was Pittman who came out with a win and both advanced into Round 4. Pedro Todaro (BRA) provided one of the heftier upsets of Round 3’s proceedings by eliminating Cam Richards (USA) and former Championship Tour (CT) competitor Nathaniel Curran (USA). The 31-year-old, Rio, Brazil native now resides in San Clemente, California and is just getting his QS career on the move — taking part of a full North America season when expenses allow. Todaro’s on his way to a good result after making it through Rounds 2 and 3, but now must hold his own against the top seeds in Round 4 when competition resumes. “I’m just so happy to make those heats today and this event is really important to me being my first QS3,000,” Todaro said. “I’m not a kid anymore so taking on these up-and-coming kids is really hard with their level so high now. That last heat I just knew where to sit and found those two good scores to get the job done. We have a big crew of Brazilians here which helps me stay motivated and strong through this event, and into the next one in North Carolina. I really want to make the next heat and just keep going with the same things I’m doing now — choose the right waves and use my priority well.” Current CT No. 32 Miguel Pupo (BRA) and QS upstart Gabriel Farias (BRA) continued the Brazilian momentum into Round 4. 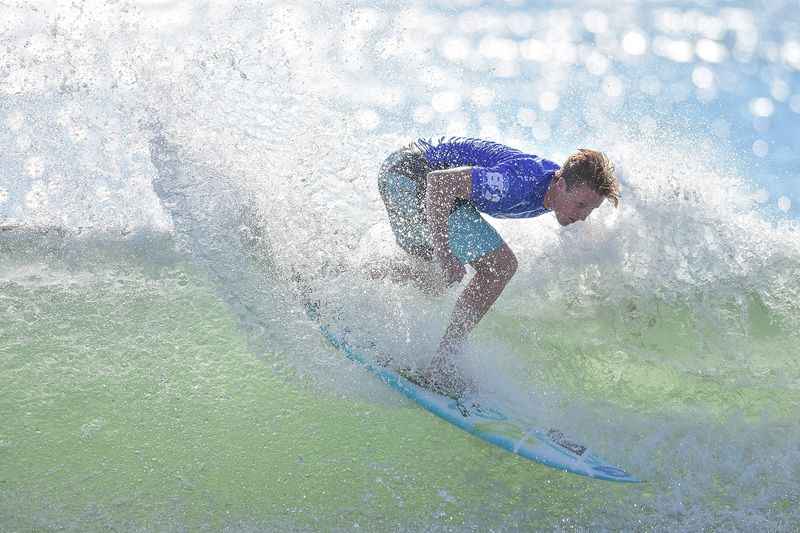 Up-and-coming talent Kade Matson (USA) continues his winning form from the Vans US Open of Surfing Pro Junior, earning a Finals appearance, into the Vans Pro QS3,000. Matson fell just shy of a Quarterfinals in the Vans Pro Junior, but earned a spot into Round 4 of the QS3,000 today after a brilliant Round 3 performance. The 15-year-old’s surfing is groomed on the iconic cobblestone break of Lower Trestles, but still manages to find his rhythm in the trickier conditions here in Virginia Beach — earning a solid 14.00 heat total. On Tuesday, Championship Tour (CT) competitor Miguel Pupo (BRA) began his Vans Pro campaign brilliantly and showed his veteran experience in the small conditions on offer. The Sao Paulo, Brazil native took to his forehand right away and blasted an 8.77 (out of a possible 10) to earn the day’s highest single-wave score — and heat total of 16.77 (out of a possible 20). Pupo is in need of a momentum swing on both the CT and QS, and hopes to turn his season around here in Virginia Beach. Brian Toth (PRI) returned to the 1st Street Jetty in winning fashion and a new place in life. The seasoned QS veteran is taking his competitive affairs much less formal in 2017 after finding a job outside the jersey, but still has his eyes set on a few key places within the tour. Toth is joined by fellow Puerto Rican Dylan Graves (PRI) into Round 3, but plays mentor to the next generation of Caribbean surfers from his native island. Before the men’s QS elite took to the water, some of the next up-and-coming talent in competitive surfing contested Rounds 1, 2, and 3 of the Vans Pro Junior. A big day of competition determined crucial Quarterfinal draws with a shakeup in the North America Top 4 already unfolding early on. One of the day’s best Pro Junior performances came from Eithan Osborne (USA) in Round Three Heat 6 with a 15.17 (out of a possible 20) heat total. Osborne’s strong surfing overpowered the wave’s softer sections and set himself up for critical finishes on the shoreline. At age 17, Osborne still has this and next year on the Pro Junior circuit before taking to QS full-time – something he’s using to his advantage by already pulling double-duty as well. Mateus Herdy (BRA) is in his first full year of pulling double-duty between the QS and Pro Junior, and brings a lot of momentum into Virginia Beach. The 16-year-old Brazilian has been climbing the ranks on the QS this year with his dynamic aerial attack and a growing power game on rail. Herdy put that potential to good use and earned Round Three’s highest single-wave score of an 8.50 (out of a possible 10). His recent victory at the Volkswagen SA Open of Surfing Pro Junior earlier this summer in South Africa solidified him as a threat to be reckoned with — after already earning a Quarterfinal appearance at the World Junior Championships to start 2017. Current North America Pro Junior No. 1 Ryland Rubens (USA) narrowly escaped an early elimination with a last-minute, near-excellent 7.57. Rubens and Tommy Coleman (USA) split a peak in the dying seconds, each earning the scores they needed to advance and knock Liam Murray (USA) out of the first-place position with no time to respond. The 17-year-old’s 2017 season on the Pro Junior has been a prolific one with two Final appearances in regional events, but will drop his result from the Vans US Open of Surfing by year’s end. The last heat of the day witnessed a blow to the Top 4 as Stevie Pittman (USA) and Taro Watanabe (USA) eliminated current No. 4 competitors Crosby Colapinto (USA) and Cole Houshmand (USA). Current North America Pro Junior No. 2 Che Allan (BRB) also made his way into the Quarterfinals alongside Chase Modelski (USA), Luke Gordon (USA), Nick Marshall (USA), Tyler Gunter (USA), John Mel (USA), Jacob Burke (BRB), Jett Schilling (USA) and the Japanese duo of Yuji Mori (JPN) and Joh Azuchi (JPN). 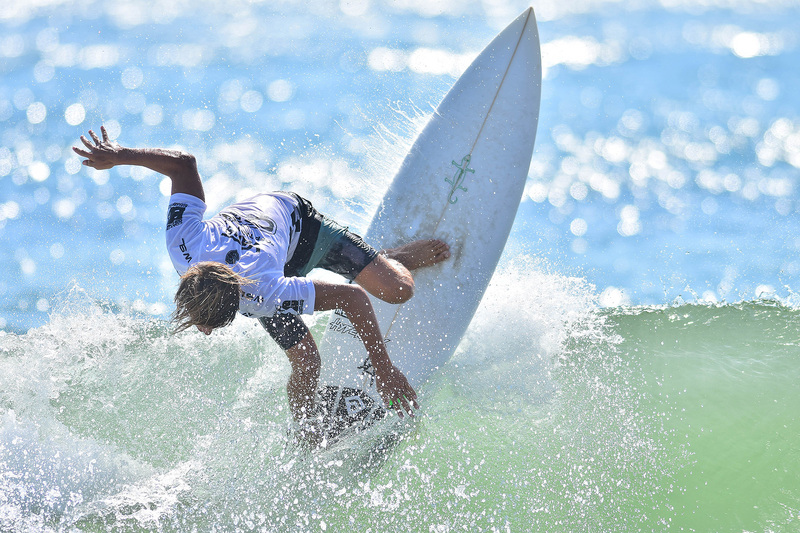 The Vans Pro Men’s QS3,000 and Pro Junior will run August 22 through 27 in coordination with the historical East Coast Surfing Championships (ECSC) — the world’s second-longest running contest, now in its 55th year, behind Bells Beach.